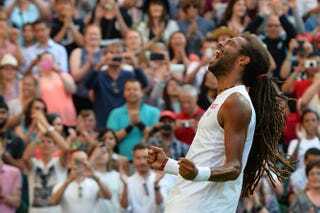 Germany’s Dustin Brown celebrates beating Spain’s Rafael Nadal during their men’s singles second-round match on day 4 of the 2015 Wimbledon Championships in London July 2, 2015. Brown won 7-5, 3-6, 6-4, 6-4. He was trained in his father’s home country of Jamaica but now plays for his mother’s native Germany, according to The Independent. Today Dustin Brown, ranked 102nd in the world, is celebrating a stunner in the tennis world, knocking out two-time Wimbledon champ Rafael Nadal in four sets: 7-5, 3-6, 6-4, 6-4. It's the first time in years that Nadal has been sent home in the first week of the tournament. The 30-year-old Brown, who is reported to have spent three years living out of a camper while traveling around Europe, had to play a near-perfect game, frustrating Nadal with some spectacular shots.